A beleaguered Russian Mars probe that has been adrift in the wrong orbit since early November should be declared a failure, a top Russian space official said, according to news reports. The Phobos-Grunt spacecraft suffered a malfunction shortly after its Nov. 8 launch, preventing it from journeying toward the Red Planet. The probe has been marooned in Earth orbit for more than a month, and flight controllers have been unsuccessful in their repeated attempts to rescue the spacecraft. According to the head of NPO Lavochkin, the Russian aerospace company that designed and manufactured Phobos-Grunt, there is little hope now of salvaging the mission, reported the Russian news agency Ria Novosti. "We should admit that Phobos-Grunt has failed to fulfill its main mission of reaching Mars," Khartov told Ria Novosti Tuesday (Dec. 13) at a space-research conference in Moscow. "This is a fact. Mission Impossible." After signals from the troubled probe were picked up by a European tracking station in Australia, the European Space Agency (ESA) joined the Phobos-Grunt rescue effort. But after several attempts to communicate with the spacecraft failed, ESA officials announced on Dec. 2 they would stop sending commands to Phobos-Grunt. With hopes of regaining control of the spacecraft dwindling, the probe will likely become a piece of orbital debris and will eventually tumble back to Earth. Khartov estimates that Phobos-Grunt could plunge through the planet's atmosphere sometime in mid-January, according to Ria Novosti. But Russian officials have maintained that Phobos-Grunt will not pose a risk to the public. Vladimir Popovkin, head of Russia's Federal Space Agency, said that the probe will break up as it re-enters Earth's atmosphere, and it is unlikely that any fragments, including the probe's aluminum tanks full of fuel, will reach the surface of the planet, reported Ria Novosti. But Khartov told the Russian news agency that some parts of the spacecraft, such as the sample-return capsule, were designed to withstand high temperatures, and could survive the fiery trip through the atmosphere. He added that Russian flight controllers will keep trying to contact Phobos-Grunt until it does fall from space. 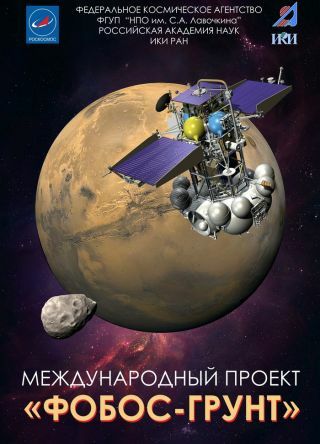 A special commission has been established to investigate the cause of the Phobos-Grunt malfunction, according to Ria Novosti. The ambitious Russian mission is the 19th robotic expedition Russia has launched toward Mars since 1960. To date, none has achieved full mission success.